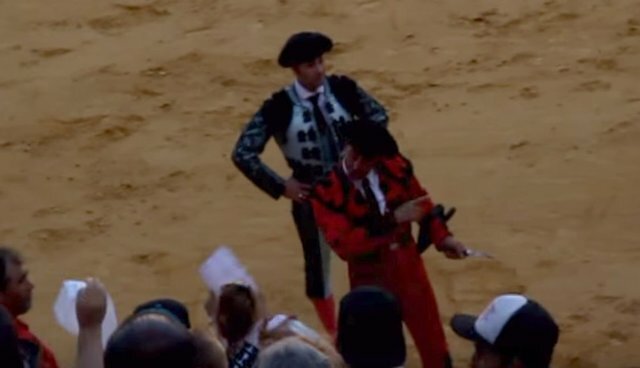 As she was pulled off the bull, the crowd of bullfighting fans jeered, yelling "fuera!" ("get out") in unison. "They called me names," said Ruiz, "they kicked me, they spit on me, they told me to go back to the kitchen and they called me a whore." Ms. Ruiz attended the bullfight alone on a day that had free admission - she did not buy a ticket to enter the 9,000-seat arena. She claimed her intention was to merely film the cruelty in the ring, which was only three-fourths full despite the free admission yesterday. Ms. Ruiz, who has been an anti-bullfighting activist since 2008, said there were at most, only 1,500 people in the ring. The side of the arena which was in the sun was empty and the shady side was only three-fourths full, she said, including "many children in attendance." After Ms. Ruiz was violently escorted out and held illegally, she was grilled on the spot by local police, who noted her address. She will be receiving a notice for trespassing and will have to pay a fine of up to 6,000 Euros ( approx. $6,700). The European parliament subsidizes the blood sport of bullfighting with up to a reported 600 million Euros (approx. $665,000,000) per year.